I went to Berkeley on March 3rd to hear Molly Dutton-Kenny speak on home abortion. She spoke regarding medical abortion, herbal abortion, menstrual extraction and vacuum aspiration abortion, all of which she is advocating being done at home. Molly has observed women receiving vacuum aspiration abortions in a home setting in other countries. She travelled to Mali to learn about female health care. She has worked with IPAS for a time. She learned about menstrual extraction from reading “A Woman’s Book of Choices”, and she learned about vacuum aspiration abortion from WHO informational material. She has personal experience with taking herbal abortafacients. She is presently a midwife and is based in California and Canada. She was delighted that I was at the meeting, and turned it over to me to speak about Menstrual Extraction. The group showed great interest in all the types of home abortion that she talked about. There was a member of Shodhini who lives in the bay area at the meeting, and she was approached about starting a self-help group there. I believe that Washington State’s abortion law, which was voted on by the people before Roe v. Wade, could be interpreted to permit home abortion. Medical abortion, taking mifepristone and then expelling the embryo at home, offers a opportunity for a doula to provide information and support. Herbal abortion is becoming a feasible alternative to females. In all of the above situations, including vacuum aspiration, it is an experienced person either providing information and support or actual hands-on assistance, however menstrual extraction as developed by the Feminist Women's Health Centers requires a group of minimally-trained women who have learned through vaginal self-examination together how to do the procedure. Molly’s ideas are very provocative, and I hope to hear more about it from her in the future. 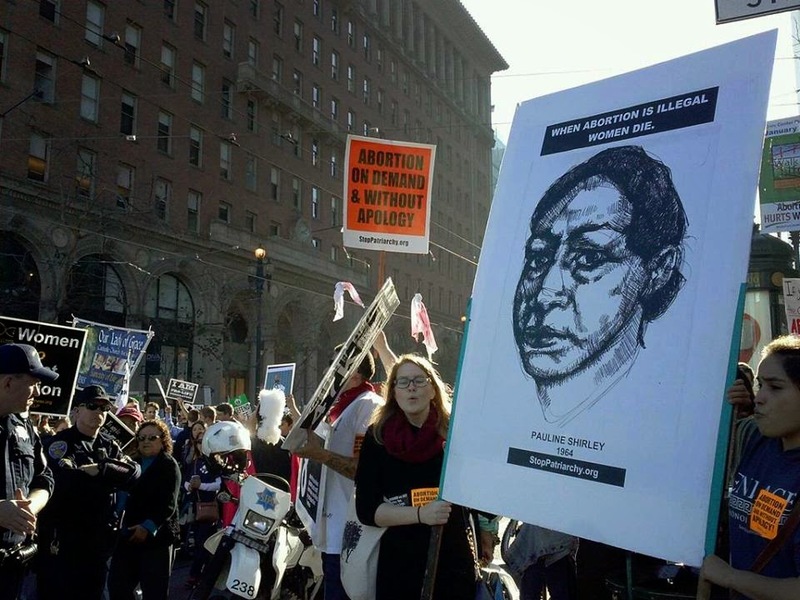 Background: StopPatriarchy.org counter-demonstrated against the Catholic Church’s annual Walk for Life. As a member of the Advisory Committee and because I love to join in with like-minded people and yell myself hoarse at anti-abortionists, I went. Many thousands of “good” Catholics marched by. They had come by bus from all the western states and their priests shepherded them. Their mood was festive, even though their signs were disgusting. There were lots and lots of kids, even babies in strollers. They looked over at us like we were monsters. The adults mostly ignored us or smiled. The marchers filled the street, curb to curb, and the march went on for more than an hour. Most of the Stop Patriarchy protestors marched alongside them, leaving the banners, the bullhorn, a few protestors and Pat and me. Pat and I went to dinner at a vegetarian restaurant. 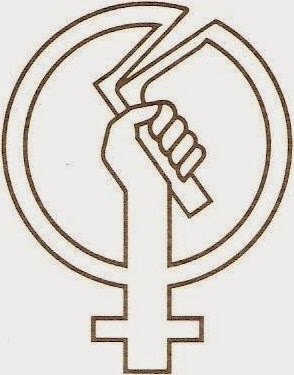 Pat recounted some of the arrests of the “Army of Three” for holding classes in self-abortion, which consisted of herself, Lana Phelan and Rowena Gurner. I wrote a quick summary when I got home. Pat’s storytelling is very droll. The self-abortion method was a digital abortion. Pat, a nurse, had aborted a later pregnancy by inserting a gloved, lubricated finger into her cervix on a daily basis until bleeding started and the fetus was expelled. So the self-abortion kit consisted of a hairnet (to keep the hair out of your eyes), a glove, lubrication, a nail clipper to cut your nails, a page of instructions and another item we couldn’t remember. The next day I drove to Chico to visit my grandchildren, Carmen and Joe, and my 2-year-old great-grandchild, Vanessa. I stayed with Thora DeLey Cox (a former director of the Feminist Women's Health Center and an author of A New View of a Woman’s Body). Thora and Jim Cox, her husband, are doing well, as are her daughters, Vanessa and Rosalind, who are now grown females (note the new terminology). Thora and I walked in Bidwell Park and discussed the Mexican situation (the killing of 43 students who had expressed opposition to the ruling politician and the drug cartels who totally run Mexico). I drove back to Oakland. I met with Sunsara Taylor. Stop Patriarchy got good press coverage of their protest. Pat Maginnis is a gifted cartoonist. She has poked fun at the enemies of women’s reproductive rights, such as the Catholic Church (she is an ex-Catholic). Also, she has been active in the peace movements, the Occupy Movement and every other progressive movement in the bay area. 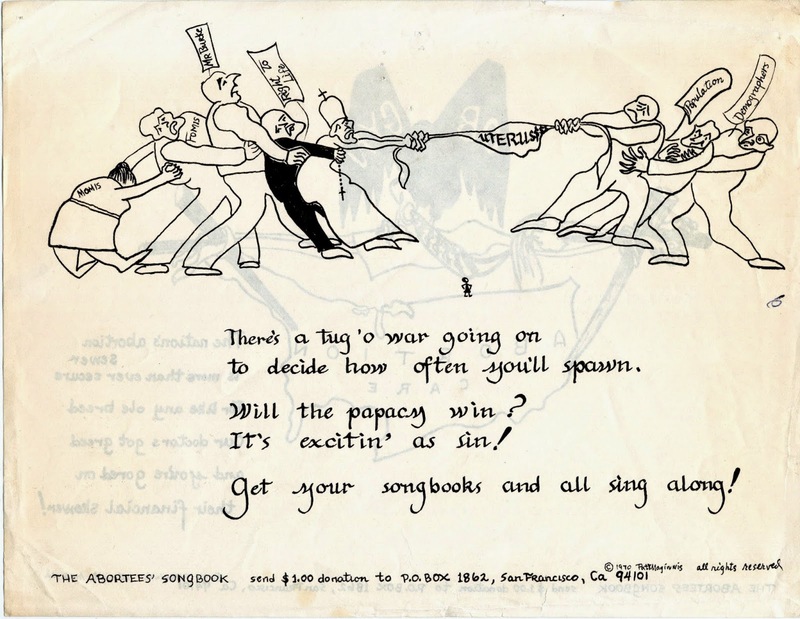 Pat’s political strategy is to take her cartoons and her leaflets with her at all times, distributing them to the waitress, to the person sitting next to her on the bus, or to passers-by at demonstrations. She also speaks out for animals’ rights and childrens’ rights. I wish we could put together a book of her cartoons, each with a brief paragraph explaining the political situation that provoked the cartoon. It would be good to have a brief biography in the front. She has also written some auto-biographical accounts of her childhood in Oklahoma. Laurie McConnell has assisted Pat to have a website, which is excellent. Pat has a circle of friends also who stop in from time to time or go with her to events. But Pat lives on a fixed income, and without support, even a relatively modest project such as a cartoon booklet can’t happen. Laurie has offered to help put the book together, but she would need some assistance to reimburse her for travel (she lives in Redding, CA which is a few hours’ drive from Oakland, CA) and some compensation for her time. Any ideas? I would love to hear from anyone who can get this project together, or at least connect me up with someone who could do a kickstarter campaign or some other fund-raising event. With Pat’s permission, I’m putting in my favorite cartoon (although she has many that ran a close second).